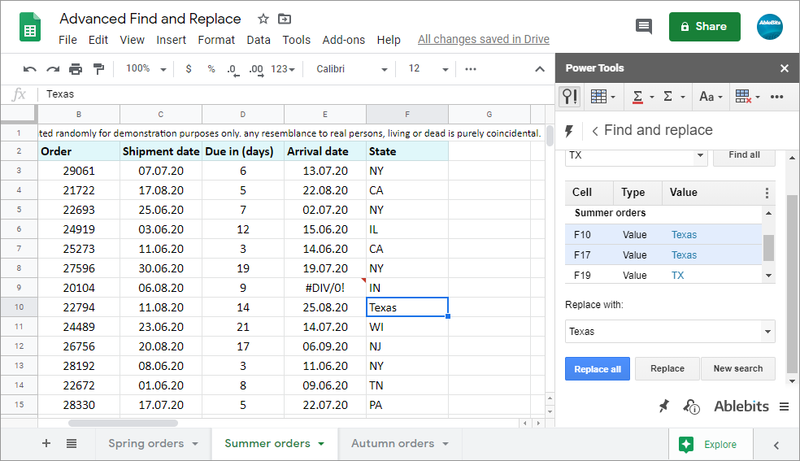 This add-on provides all you need for advanced search in Google Sheets. You can have your value in formulas, notes, links, and errors on different sheets - the tool will show you the entire list of matches. A click on any result will bring you to the necessary cell in an instant. Besides being able to export the found records, you can replace all or only the selected values with any entry of your choice. 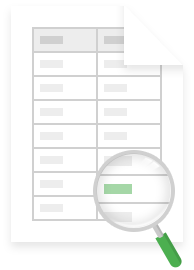 Search within the selected range of cells or across multiple sheets Have the add-on scan a particular data range or choose the sheets to look in. Find exact matches only Pinpoint only cells that match your searched record entirely. Conduct case-sensitive search Look for the records written exactly as you enter them - in the same combination of lower and uppercase letters. 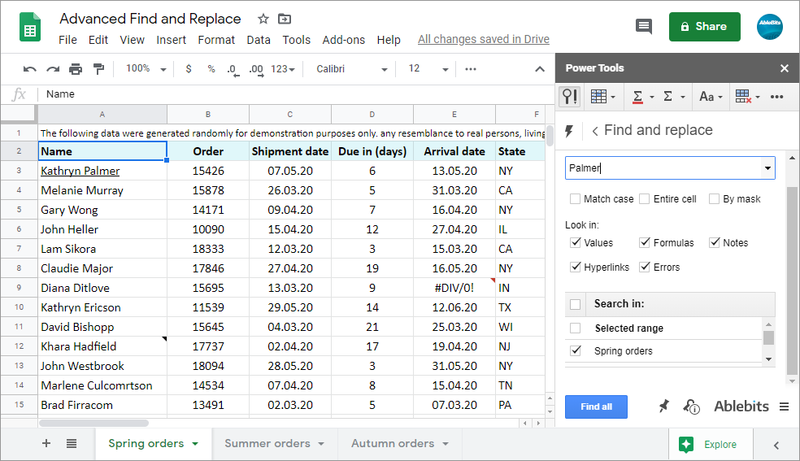 Find and replace in values, formulas, notes, hyperlinks, and errors	Scan all these types of data simultaneously or tick off only those you’re interested in. Replace all or only selected values at once Substitute all or only some of the found entries in a button-click. 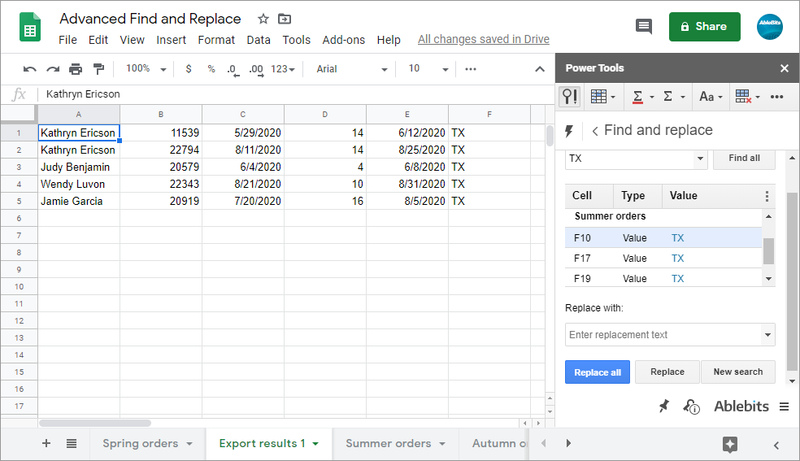 Export the results to a new sheet Transfer all found entries or only rows with the values you're looking for to another sheet. What is Advanced Find and Replace and what do I need it for? 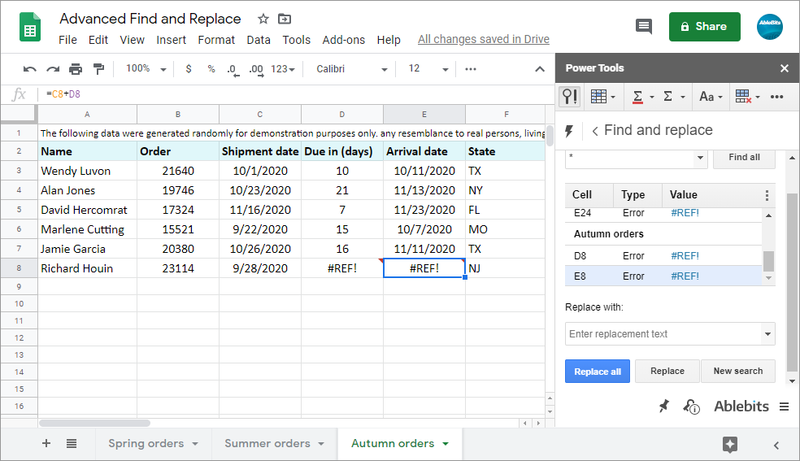 The add-on represents an enhanced mechanism of finding and replacing data in Google Sheets. Its advanced options provide a thorough scan across multiple spreadsheets or within the selected range. Enter the search query and pick other criteria: consider case and data type, or retrieve the cells that contain only the exact entry. The add-on will get the most precise results by picking all relevant items. How does it differ from the standard Google find and replace feature? 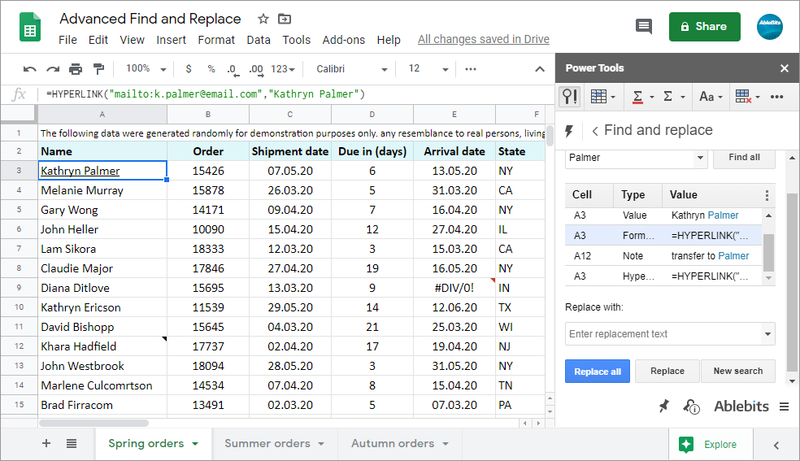 Our add-on finds and replaces data in formulas, notes, hyperlink, and errors. With this tool at hand you can forget about switching to each found value one after another. You will see all matching records listed with the cell address and data type. Simply click on the record in the list to select it in your sheet. You can also change multiple values with a click. And if you'd like to bring the search results to a separate sheet, simply export them with any adjacent data. How do I do an advanced search in Google Sheets? Enter the record to look for. Specify the type of data to search within: formulas, values, notes, etc. Check the sheets you’d like to scan. How can I manage found records? To replace all values at once, enter the new text and click Replace all. To change only some of the found records, select them in the add-on tree view, enter the replacement text, and click Replace. To export values, click on the icon with three dots right above the list of found results and choose what to transfer. Is your add-on case sensitive? Yes, if you decide to make it so. :) A special Match case option lets you differentiate between the same records written in various cases. What types of data does your Find and Replace process? Our tool is capable to search within values, formulas, notes, hyperlinks, and errors. Can I check my spreadsheets for all notes, formulas, or hyperlinks only? Sure! A useful option called By mask and a couple of wildcard characters will help you indicate the pattern of the values to look for. For example, to see the list of all errors, tick off By mask along with Errors to look in. Then enter the asterisk (*) into the Find what field and press Find all - the tool will do the rest. I have multiple spreadsheets that are being updated constantly. Should I still set searching options each time I run the add-on? No, Advanced Find and Replace remembers the options you check and keeps them that way for you on the next run. You’ll only need to enter the text to search for and hit Find all. Get all new features and updates for free ever!